Faithful Steward Web is true web church management that's securely accessible from anywhere you need to work with your church information. It's church software made easy starting at $20 a month. We also have web church accounting software that gives churches a complete Fund Accounting system that is available either as standalone or as as integrated part of the member management and church donation management. The member management features of Faithful Steward Web help you keep track of your members' information. From attendance tracking to handling small groups, nobody will ever go unnoticed. It even provides online directory software to generate picture or non-pictorial directories. Faithful Steward Web's contribution features let you process every church donation quickly so you can get the deposit to the bank. It also includes pledge campaign software to keep track of each of your campaigns. 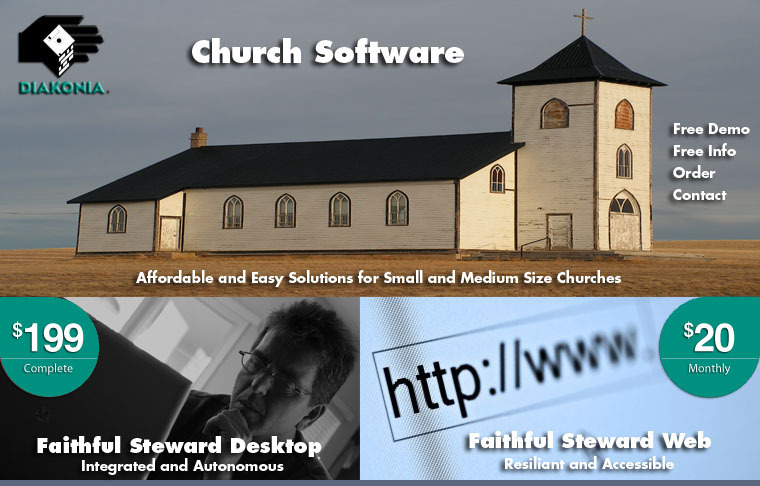 Faithful Steward Desktop is our church management software which includes the essential tools of software for church and non-profit organizations. For only $199 we have both Windows and Mac versions available. Try our FREE DEMO today! Inside Faithful Steward Desktop's membership software is easy-to-use directory software, which can include photos and information about both families and individuals. The built-in membership features makes keeping track of church small groups easy with its church attendance software features. Faithful Steward Desktop's donor management saves you time by making it easy to keep track of contributions. The built-in pledge software handles your campaigns and includes church bookkeeping software links. Best of all, it can print your church report to answer questions for your staff and donors.